"The foodie book of the year" The Spectator''An inspiring book for city dwellers who pine for the bounty of a countryside hedgerow' Sunday Times'The forager's magic trick; To conjure a meal out of seemingly nothing and ensure you never look the same way at a neglected green space again' Daily Telegraph'I love the idea that I could pick up dinner from a local park rather than from a shop on the way home. A book about urban forging could so easily have been worthy, but it's an entertaining read with recipes: get ready for nettle tempura...' Delicious magazine'A man after my own heart.' Mark Hix'That is the final act of the forager's magic trick. To conjure a meal out of seemingly nothing, and ensure you never look the same way at a neglected green space again' The TelegraphOnce you start foraging, you'll never look at the city around you in the same way again. As we walk through the city with our headphones in or our eyes glued to screens, it's easy to forget that we are surrounded by wonderful things to eat. Our parks, pathways, gardens and wild spaces are crammed full of delicious, nutrient-rich plants; all we need to know is how to find them. From dandelions to winter cress, wild garlic to chickweed and ground ivy to water mint, this book takes us through a year of delicious, foraged food. Each entry is illustrated in colour to help you identify the plant and followed by a recipe using these remarkable ingredients. 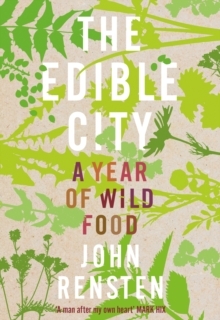 In The Edible City, urban forager John Rensten gives us the tools to identify, source and cook delicious food from the year-long bounty around us, whether that's nettle and three-cornered leek gnocchi, winter purslane pesto, or stinging nettle tempura. This account of a year of urban foraging is perfect for any nature lover or home cook looking for exciting new ingredients to experiment with.